Harris Tweed. Every heard of it? If you have, what do you think of when you read the words ... Harris Tweed? Old grannies' skirts. Old men's caps? Well, you'd be forgiven, I guess, because for many years, tweed was the domain of the older folks; of men's jackets that never wore out; the chosen gear for the shootin', fishin' brigade. But no longer: now Harris Tweed can be seen on the Paris catwalk and on movie stars. And in Nike trainers. Harris Tweed has been handwoven in the Outer Hebrides for centuries. When the manufacture of other cloths was industrialised, during the age of industrialisation, Harris Tweed retained its distinctiveness by the nature of its manufacture: it was, and still is, handwoven in the Outer Hebrides. is protected, and can only be placed on cloth which has been produced on these islands, and by its distinctive method. In 1909, Harris Tweed was defined by the Harris Tweed Association as "hand-spun, hand-woven and dyed by the crofters and cottars in the Outer Hebrides." Over the next week I'll show you some photos of the loom on which Harris Tweed is woven by numerous weavers on our island. I'll speak to a weaver and let y'all know some of the positives and the negatives of being in this line of work. And I will speak of some other cottage industries that have been set up, making and selling Harris Tweed items. Oh, and one more thing: I'll have a giveaway, and yes, it'll be connected with Harris Tweed. Watch this space! Wow! That is fun information to have! I had not been familiar w/ Harris Tweed before now. Look forward to learning all you have to post! What great information! The whole family is reading about this history! We, too, look forward to learning more! Cool to know! 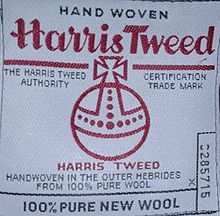 I hadn't heard of Harris Tweed before, but I look forward to hearing/seeing more. O yes, and you have me uber-excited for the giveaway! To me Harris Tweed means handbags! I have about 5 of them!! One thing I wish I was was a weaver. So I look forward to seeing weaving. They are doing Harris Tweed in school just now, lots to learn about it! Is there any place online where one can order any Harris Tweed items? I love handmade, well-made clothes! Interesting! I am looking forward to more information. Love the story about the Nike Trainers... This is so cool, a field trip without having to step away from my laptop... Can't wait!! !